One of the advantages of being in Lund is that you’re only 1h train ride away from Copenhagen, where you can enjoy some “big city” events. Throughout December, there are many Christmas markets to be enjoyed. Not only a sight to sore eyes but also some typical and tasty food can be found. Definitely a trip worth taking. 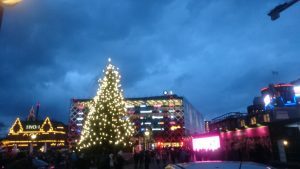 This entry was posted in Uncategorized and tagged Christmas, Copenhagen. Bookmark the permalink.